I am 26 year och I do my second winter in Kiruna with Team Åsa&Kajsa. I have also been working with sleddogs in other places in Sweden. I am certified guide and have been guiding sumer- and wintergroups in our beutiful mountains. 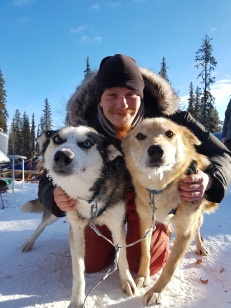 I have been working med sleddogs for more than 4 years and I realy enjoi meetings with our guests and steering the dogsled. 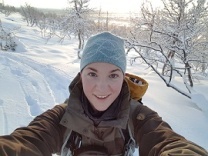 I am 27 year and I do my first winter in Kiruna and with Team Åsa&Kajsa. I have worked as a handler/tourguide for 2 seasons for another kennel in Sweden. I come from Netherlands and speak Dutch, English and a little bit German and Swedish. I love wintersports and dogs and I like being in touch with people and make them familiar to the dog sleding.